Carte de la Turquie d'Asie de la Perse de l'Afghanistan et de l'Arabie. 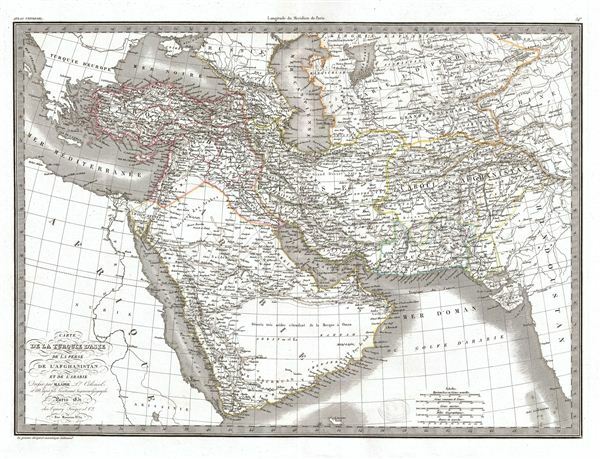 A fine first edition example of M. Lapie's 1831 map of Turkey in Asia. Detailing the declining years of the Ottoman empire, this map includes all of Arabia, Turkey in Asia, Persia, Afghanistan, and Independent Tartary, as well as adjacent parts of India, China, Russia, Turkey in europe and Africa. This map was engraved by Armand Joseph Lallemand as plate no. 34 in the first edition of M. Lapie's important Atlas Universel. This map, like all maps from the Atlas Universel features an embossed stamp from the Lapie firm. Rumsey 2174.034. Phillips (Atlases) 754, 765.